The benefits of practicing true listening are very real. Through refining our listening skills, we not only understand just what to say; we also understand when not to say anything at all. We become more open, present, and responsive. In turn, we renew the sense of peace within ourselves. And the effects on our romantic, family, and professional relationships are undeniable. 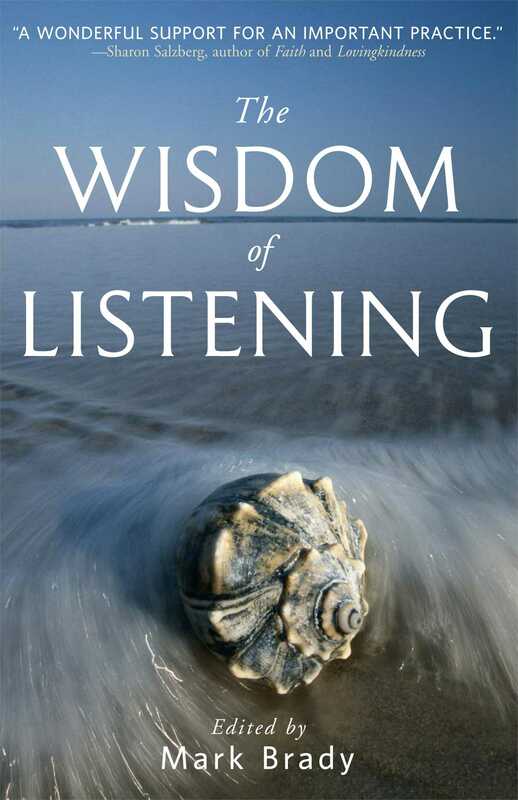 In The Wisdom of Listening, award-winning author, teacher, and trainer Dr. Mark Brady and contributors that include Ram Dass and A.H. Almaas, help us to develop the ""listening warrior"" inside us all. Inspiring and easy to follow, the lessons here can transform the ways that we interact with others, whether in a large meeting or in a face-to-face encounter. Listening is almost a lost art: some of us may have forgotten how to do it; some of us may have never quite learned. The Wisdom of Listening gives readers the skills to overcome our culture's tendency towards distraction and reaction, and to be more fully in the world. "In this thoughtful anthology, 18 contemporary spiritual teachers explore the transformative effects, and the difficulties, of skillful listening and suggest ways in which becoming a 'listening warrior'--someone who listens mindfully, with focused attention--can improve relationships. Free of religious dogma and self-help cliches, the essays are inspiring, intelligent, and accessible." "Brady has put together a very helpful anthology of 19 essays with sections on the promise, the practice, and the power of listening. Among the contributors are spiritual teacher Ram Dass; Marshall Rosenberg, founder of the Center for Nonviolent Communication; Anne Simpkinson, an editor for Prevention magazine; Kathleen Dowling Singh, a therapist and workshop leader; and Rodney Smith, director of the Hospice of Seattle. Using a variety of terms to describe this type of communion with another--deep listening, listening with the heart, listening with the third ear, devout listening (a Quaker term), fierce listening, virtuoso listening--they offer suggestions, perspectives, and practices that will reinforce your intentions to be a good listener." "A fascinating book that deals with listening from different philosophical, therapeutic, and religious perspectives. Some of the writers suggest listening as a means of self-discovery. Others see listening as a way of understanding people. The book invites us to consider various contexts in which one listens [. . . ] Whether in a therapeutic or interpersonal situation, it is important to examine what we are doing and why we are doing it. This is provocative reading." "A wonderful collection of essays on an immensely important topic. Useful and illuminating." "This is an excellent collection, full of gems of personal experiences and tips on the art of listening and also questioning and being with. A good bedside table book to dip in repeatedly to remind one of the importance of listening with empathy, awareness and creativity." "This collection of essays raises listening to a spiritual art. There is, truly, much wisdom in The Wisdom of Listening. There is a strong emphasis in the essays on listening as it is applied in the helping professions, such as social work, psychotherapy, and hospice work, and those professions are well represented among the contributing writers. Each writer, from his or her unique perspective, affirms the underlying truth that our true natures are wise, compassionate, and receptive. The book offers the opportunity to look at skillful listening from eighteen different points of view, through eighteen different sets of eyes and hearts. It is impossible to exaggerate the importance, urgency, and value of this book." "Bravo! As I read The Wisdom of Listening, I kept marking passages and copying bits out to send to friends--a good sign! This book is a treasure chest of useful and meaningful practices and ideas." "This anthology is a treasure full of teachings on the art and psychology of listening well, and the profound spiritual and psychological healing that can occur when we are able to listen well and deeply, to ourselves and to each other. The nineteen writers here represent a diverse range of backgrounds, approaches, and professions. They include Buddhist practitioners, chaplains, psychologists, and hospice directors... From this book you will learn about many kinds of listening--deep listening, intuitive listening, proactive listening, dynamic listening, fierce listening--as well as the wonderful results of all this listening, such as accurate hearing, compassionate understanding, and ultimately, connecting more deeply to ourselves, to each other, and to our own true nature as spiritual beings." "This anthology's greatest strength is its presentation of listening as a gift that can transform human experience at all levels, from individual human suffering, to group wisdom-sharing, to planetary awareness... The illuminating relationship between meditation and listening receives significant attention. Also, most of the writers present their wisdom as it has manifested in the living context of their work as religious teachers, professors, hospice workers, therapists, and social activists. The contributors deepen and broaden the experience of listening, and Buddhist practice and caregiving are beautifully integrated in [pieces by] Christine Longaker and Kathleen Dowling Singh. . . The best of the essays here inspire a delightful eagerness to read, and build joyful expectancy about seeking the wisdom of listening."